This ingredient is amazing for the skin it works to fight free radicals thanks to its antioxidants. It also helps with reducing stretch marks, hydration, and healing sensitive skin. Is an amazing product for the skin it works to hydrate and boost collagen in the skin. It also helps to protect and heal due to the Vitamin F which contains essential fatty acids. This one is a little hard to explain, it smells slightly spicy but not overwhelming like Rub-A535 or other stronger muscle pain relief. Honestly speaking at first I was not fond of the smell but I thought if it helped then the smell was something small but over time you do get used to it. My initial impression of the massage bar was that it melted extremely quickly; it started to melt in my hands right away even before I started to use it on my neck. I did not find that it did much for my muscle pain but it did moisturize my skin very nicely. The bumps were great but since it melted so quickly, so did the bumps which were a little disappointing. I will not repurchase the bar again but may give the other ones a try. Overall, I did not find this product one of Lush’s best. ** If you have not done so please check out my FACEBOOK page for updates and giveaways. Jojoba Oil aids to fight facial lines, scarring and fatty tissue. Also it is often used for healing acne and skin psoriasis. Is an amazing product for the skin, it works to hydrate and boost collagen in the skin. It also helps to protect and heal due to the Vitamin F which contains essential fatty acids. This bath bomb smells amazing! It smells a lot like apple cider, which is one of my favourite winter drinks. It has the spicy apple and cinnamon fragrance to it that simple warms up your mood. This bath bomb has 2 components to it; a ballistic center and a bath melt on the outside. When I first threw the bomb in it instantly started to fizz and dissolve, turning the water a beautiful purple-pink hue. As a side note this bath bomb does have a small amount of shimmer but it was not significant enough to bother me too much (I am not very fond of glitter on my skin). The bath did soften and hydrate my skin while leaving a warm apple scent. I really recommend this for the cold winter days; it really warms you and your mood up. On the down side, it was very hard therefore I could not break it apart for multiple uses. ** There are giveaways going on my FACEBOOK page please enter for a chance to win ! Coconut oil is known to have multiple benefits for the body; in this case it works to prevent dry and flaky skin. It also works to delay the appearance of wrinkles and sagging skin that comes with age. This is an ingredient widely found in perfumes however it also has many benefits. It is great for depression, eczema, mature skin, and stress. The Rose Jam smells amazing! It has a sweet rosy floral scent that does make your skin smell amazing. I highly recommend this bubble bar if you love the scent of roses. 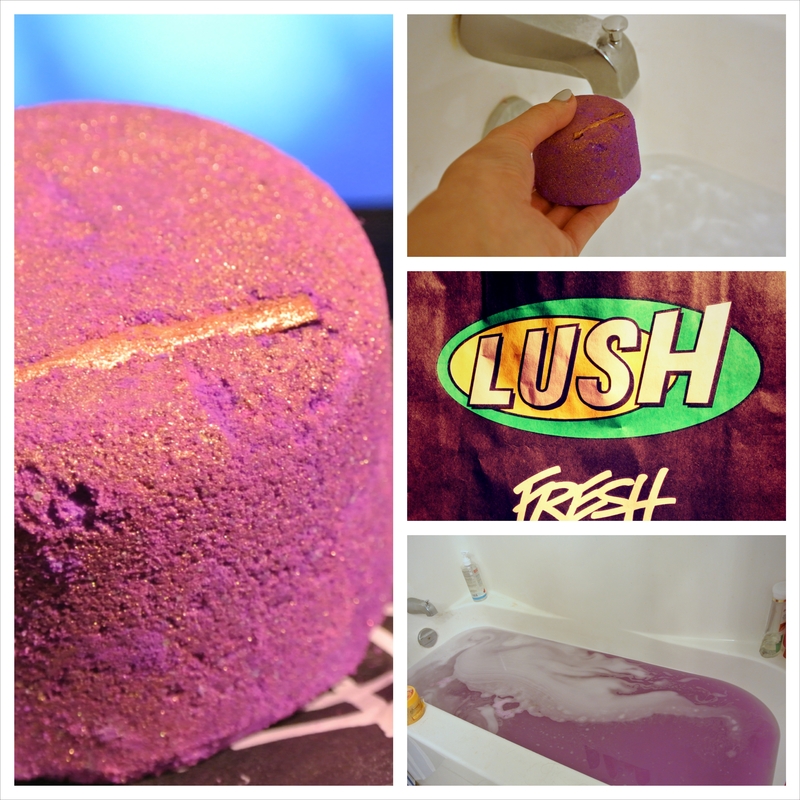 This bubble bar is one of my favourite products from LUSH and I have repurchased it many times. This product gives you a bubble bath with moisturizing effects. From my experience with the product, I have noticed that it does make my skin a little softer and less dry however it is not enough to replace your moisturizing routine for your body. As for its bubble producing abilities, a little does go a long way, you only need about a quarter of the product to produce some bubbles for your bath. It dissolves well if you break it down under the tap. On the down side, due to its oily center that connects the two halves it may make a small mess where you store it, so i suggest keeping it away from cloth or paper. I made the mistake of putting it close to a towel and it left a small pink stain. Overall, this is a great product for baths especially as it does work to moisturize and hydrate your skin. * I also have giveaways going on, on my Facebook page so go there to find how to enter. I wanted to start off my Lush series with my newest favourite product from Lush – Dark Angels. Which is an cleansing exfoliator, made from ingredients below. This is great for detoxifying your skin while improving your skin’s texture, clarity, flakiness, dryness, and elasticity. Do not be alarmed by this ingredient if you have oily skin. This will not break out your skin, instead, it will rejuvenate and lightly hydrate your skin along with reducing signs of aging. It is well known that avocados have a high level of Vitamin E, which is an antioxidant that works to neutralize free radicals and prevent cellular damage from occurring. This ingredient works to absorb excess oils along with deep cleansing the skin. This ingredient works to exfoliate your skin leaving your skin smooth and free of flakiness. I bought this product because it contained black sugar and charcoal, which are ingredients that are great for exfoliating, cleansing, and absorbing oils from the skin. The product, as you can see in the pictures above, consists of a fine grain mixed in with larger black sugar crystals. This gives you an amazing exfoliation that cleanses the skin without stripping it dry. It is an amazing product if you are looking for an exfoliation product, especially for the men out there. It provides a medium to strong exfoliation, therefore using it once to twice a week would be ample. I love this product as it leaves my skin feeling soft, smooth, and lightly hydrated, I also have no noticed any breakouts following the usage of this product. On the down side, it is a grainy consistency without much to hold it together, which makes it hard to pick up the product to spread onto your skin, even after mixing it with a little water. However, once you get it onto your skin it is easy to massage into your face without losing a lot of the product. Overall, I was really pleased with this product and would recommend this to you if you love product made from natural ingredients. Lastly, just as a side note, the product will make a small mess in your sink during usage, but is easily washed away with a light splash of water. I personally am a little picky and sensitive when it comes to smells and this is what often turns me away from using Lush product. This would product would definitely fall under this category, as it does carry a light charcoal scent paired with a rubbery smell. On the plus side, this product’s fragrance is not extremely repulsive nor does it give me a head ache. Overall, if the smell does not bother you it is a great product to try. As someone who used to paint a little, I loved the packaging, as they reminded me of the tubes paint come in. Each has their own unique labelling design that goes beautifully with the product. I have not had much difficulty getting the products out of the tubes so far, and have not come across any other complications as of packaging. Pivione Flora captures the frangrance of peonies very beautifully. The cream smells sweet and floral making it a perfect option for spring. Not only does it smell amazing but it moisturizes my hands well, without leaving a sticky residue. It absorbs quickly into the skin giving you a smooth feeling instead of a greasy feeling like many other hand creams. I also did not find myself needed to reapply the product often, so this is great for normal to a little dry, skin types. Cherry Blossom’s fragrance sits on a little stronger side than Pivione Flora, however it is still retains a sweet floral scent. The consistency is quite similar to the Pivione Flora cream as it absorbs quickly into the skin and makes your skin smooth to the touch. Once again it does not have a sticky or greasy feeling to it following application. This is a great option for spring if you like a stronger floral scent, and just like Pivione Flora it is great for normal to a little dry, skin types. Almond carries the exact same fragrance as their almond line (which is amazing). the fragrance smells like sweet milk with a hint of almond, it gives me a sense of feeling fresh. The consistency is a little thicker than the 2 floral hand creams above, but not significantly thick. Like the other 2, it also absorbs well into the skin and works quickly to moisturize your hands. The almond hand cream would be ideal for normal to medium dry, skin types. Shea Butter’s fragrance reminds me a lot of baby lotions (which I am personal not a huge fan of). 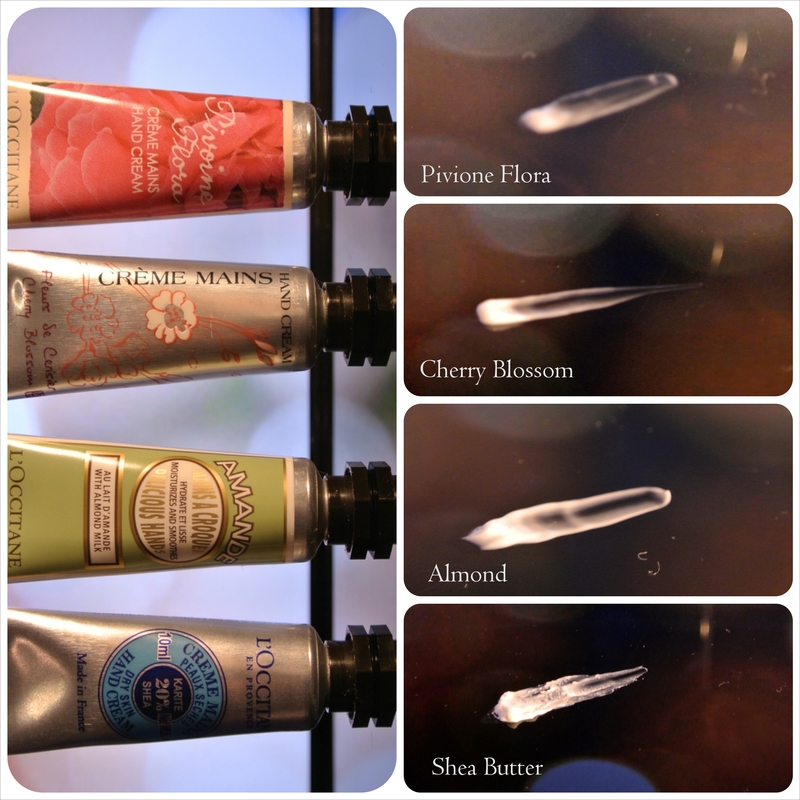 The consistency is a lot thicker than the floral and almond hand creams, kind of like a body butter consistency. The thicker consistency is due to the fact that it is enriched with 20% shea butter, which is known to be amazing and moisturizing for the skin. It does not leave a sticky feeling, however it does leave a bit of a mix between a moisturized and greasy feeling. It does replenish the skin well and would be great for dry skin types. This would be ideal for the cold winter months,to protect your skin from the piercing cold winds. L’occitane has done an amazing job with their newer line of hand creams, in comparison to their old formula, which was moisturizing but sticky. The fragrances of their hand creams are all amazing and beautiful without being over powering. The new formula also absorbs quickly into your skin which leaves your hands feeling smooth and silky. You should definitely go smell their Shea Rose Heart and Lavender hand creams as these also smell amazing! **ALSO if you have not done so, please enter the giveaway! It closes on April 1, 2014 so enter soon!